mmeiser blog: Sifry's State of The Blogosphere! Sifry's State of The Blogosphere! Wow, this is fascinating stuff. Ever since hearing Dave Sifry's October state of the blogosphere on IT Conversations I've been dying to hear the updates and here it is. Amazing. Some of the points. -30,000 to 40,000 (NEW) weblogs each day! note: This is where it's gets very interesting to me, since blogging is so transparent google and technorati have been very effective at quickly identifying and blocking 90% of blog spam, it's still a dangerous game and could spin wildly out of control still, but so far the transparency of the medium has proven resilient. -what's expected next: the big news on the big indicators: readership and the volume of posts which really reflect the growth of the blogosphere a whole lot more accurately, his last report from Oct, stated that readership was outgrowing new readership by huge bounds, great news for bloggers everywhere. We're not just talking to ourselves here. Can't wait for the update! "It's been 5 months since my first presentation on the State of the Blogosphere at the Web 2.0 conference, which I later posted in parts. A lot has happened, and its time for an update on what's going on in the world of weblogs, and to have a look at the numbers. Technorati is now tracking over 7.8 million weblogs, and 937 million links. 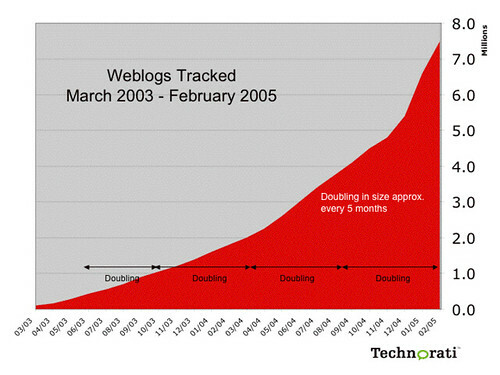 That's just about double the number of weblogs tracked in October 2004. In fact, the blogosphere is doubling in size about once every 5 months. It has already done so at this pace four times, which means that in the last 20 months, the blogosphere has increased in size by over 16 times"